Hereafter there is a simple test of six online HTML files converters, represented by Google Search. The reason we picked these on-line services is that Google suggests them to all users looking for a free HTML converter. Let�s try them all and see the results of conversion to PDF, as the most popular format suitable for sending via e-mail, sharing, archiving or off-line reading. Usability, both free and paid options, speed of conversion and output formats are also features to compare. The first one zamzar.com doesn�t support HTML as the �from format� – it is pity, but it is true. Let�s go further. This one is good. Friendly interface except for many advertising banners. All steps are quite clear, but there is an instruction line just in case. One can convert from HTML to PDF by pasting a web page address only; there is no possibility to convert by uploading an HTML-file. It is very pleasant to have an opportunity to adjust for free the settings such as page orientation and page size. As a result one can have a PDF file with a proper layout, loaded images and most links working. The process takes just some seconds even for a �heavy� web-page with many images in it. Another option offered on the website for free can be used, when one does not need to save pictures to PDF, it is possible not to load them. Well, but this time the option failed to work. But the general conversion result is satisfying nevertheless. There is no additional functionality for charge or a licensed version to buy. Everything is free, but donations are welcome. CoolUtils.com�s converters are widely spread and known, so let�s see how online HTML converter works. On the page coolutils.com/online/html-converter there are three steps. Conversion is fulfilled from an HTML-file and not by pasting URL. That is why the instruction how to get HTML-file for one who has web page address only will be useful. The conversion process is very quick: the file is uploaded immediately; and in two seconds the PDF is ready. But for a heavy file with images it takes some time to be converted. Outcome is sufficient: layout, fonts and links are saved. More than that, options to add pages in header and date in footer show good result. Other options � to convert in Doc, Excel, Tiff, Text, Jpeg are also tested with adequate outcome. Seems like it is the only online converter among these six ones which offers different output formats for free. For professionals there is an opportunity to download trial version of Total HTML Converter and convert thousands of HTML pages from both a file and an URL. It also provides additional options like watermarks or digital signature added to the output file. Some different options are offered by web2pdfconvert.com, the service resultant of 13 years of experience in building web products. For example, one can put PDF button into a browser and convert web pages to PDF files in an easy way. Option to add PDF button to a web-site and allow visitors to convert web pages of this site to PDF may be found useful too. In general, conversion provided by this on-line service is the same and also quick even for a heavy web-page. To get PDF file one needs to past a web page address; HTML-files cannot be browsed. As a result you get a proper layout with images, but with no working links � they lose �www� in some way at the beginning. 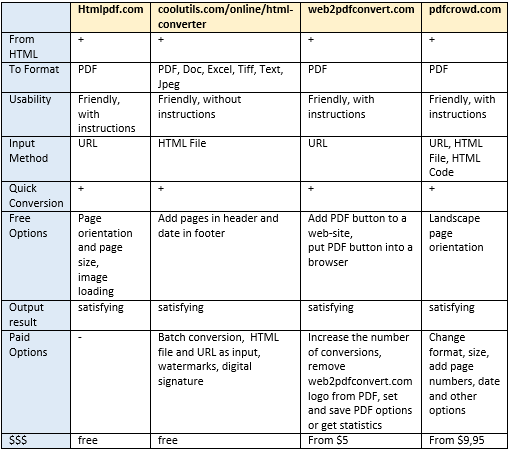 To expand options one can chose from the three payment plans and increase the number of conversions, remove web2pdfconvert.com logo from PDF, set and save PDF options or get statistics. For free it is possible to download a converted PDF-file as well as to add it directly to Google Docs with just one click. It is a sustainable tool which converts web pages, HTML files and HTML-codes to PDF format only. Interface is user-friendly with some reasonable instructions. Conversion process is quick as it should be, for a heavy web page as well. Resultant PDF file looks eminent: pictures and layout are saved after conversion and all links work perfect. For free landscape page orientation is available. To change format as well as size, add page numbers, date and other options is possible in the paid account. Quick button in a browser is also available to add when one becomes a member. While it is free to add HTML to PDF button for your web site by pasting a code into web site HTML. This is the 6th service we get from Google Search. It turned out not to be an HTML converter, but an HTML-texts cleaner. We can test other services, but that is all for the first page of Google Search representation. Others cannot be counted as top converters in the specified conditions. Hi there! I didn’t know all of these converters mentioned in the article, but I tried kitpdf.com toolkit and it worked just fine to convert webpages into pdf documents. Thanks for sharing these tools! I like Zamzar and some other tools, they are really good.